Two nights ago, I stood before an audience filled with runners. There sat an American running his first 42K. Across him was a Canadian half-marathoner. Dozens from Cagayan de Oro arrived. 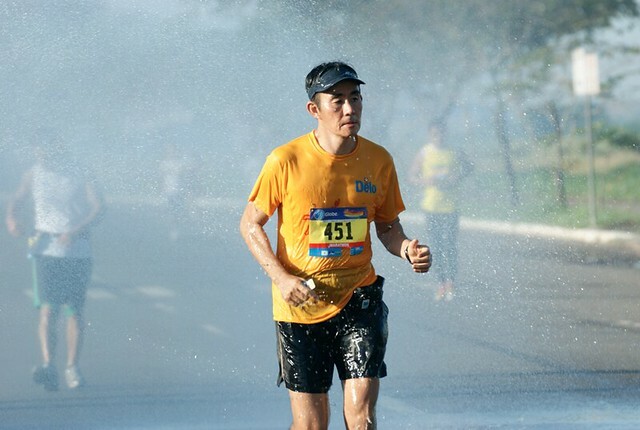 Victor Ting, 67 years old from Manila, previously finished a 160-km. trek. He’s joining the Cebu Marathon today. Mayor Mike Rama did not sing — he gave a speech and is running 5,000 meters at 5:30 this morning. Maayong gabii kaninyong tanan — to our guests from out-of-town, welcome to Cebu! This is the event’s sixth year. 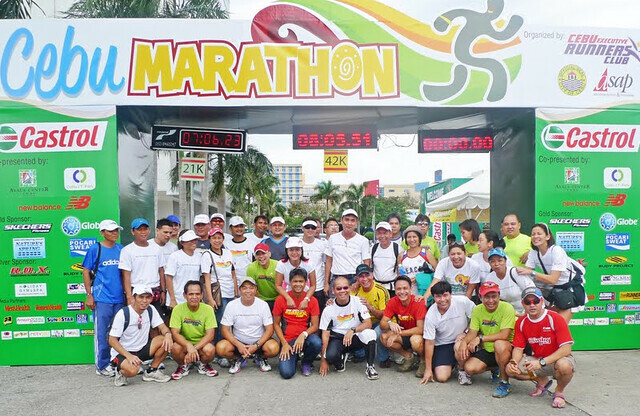 What makes the Cebu Marathon different? Is it the prize money, because we offer the most? The distance, because we’re the farthest? The number of participants, because we have the most? No. Some races offer more money, have farther (100K) distances, and have tens of thousands of runners. First, the timing. Our event is not held in March or August. It’s always on the 2nd Sunday of the year. It’s part of the festivities of the Sinulog — the country’s biggest festival. If the DOT says “It’s more fun in the Phils.,” during the Sinulog, “Running is more fun in Cebu!” Today, runners will see buntings and lights all over, they’ll hear the Sinulog beat playing, there’s dancing… it’s not a boring race. It’s festive and lingaw. Second: Our land, Cebu. Our city. Our province. Our history. Eight years from now, we will celebrate the 500th anniversary of Ferdinand Magellan’s landing. Cebu is that historic. We are considered the oldest city in the country. For the 21K and 42K runners: you will be passing through some of the most historical sights in the country. First, we start at the Cebu I.T. Park, the city’s premier business district. Then you pass along the Provincial Capitol, Osmeña Blvd., Fuente Osmeña, Colon St. (the country’s oldest), Sto. Nino Church. My favorite spot? Running in-between the Magellan’s Cross and the City Hall. Next, Malacanang sa Sugbo, Plaza Independencia and, possibly the only run to do this nationwide… underneath the Tunnel. Then the South Road Properties. We have the best route of any marathon in the whole Philippines! Maybe one of the best in Asia. Third reason: the people, the Cebuanos. We have a genuine partnership between the public and private sectors. The city government is giving the total cash prize of P389,500. We have the support of Ayala Center Cebu, Cebu I.T. Park, New Balance, Globe, Pocari Sweat and Nature’s Spring. The support of the Talisay City officials, DPWH, CITOM, TODA and the SRP are crucial. VOLUNTEERISM. The men and women behind this event are not being paid. You know why we’re helping? Because we ourselves — all of us at the CERC — are marathoners. And many of us have travelled all over the world — from Chicago to Paris to Hong Kong to New York to Amsterdam — to join marathons. And if not also for the volunteers in all cities in the world, then we would not have been able to join. We are giving back. This time, to you. We want you to experience the pain(!) and satisfaction of finishing a 21K or a 42K. It’s a moment you’ll treasure forever. In the streets this Sunday (today), don’t be surprised if you’ll see doctors, lawyers and top businessmen giving you a massage or a cold drink at the sidewalk. Fellow runners: it is 32 hours from race time at 4 AM on Sunday. Congratulations! Each of you here — for joining, for spending hundreds of hours on the road, for waking up at 4 in the morning to run when everybody else is asleep, for all your sacrifices — each of you here is a winner in life. Continue to enjoy running. Enjoy Cebu. 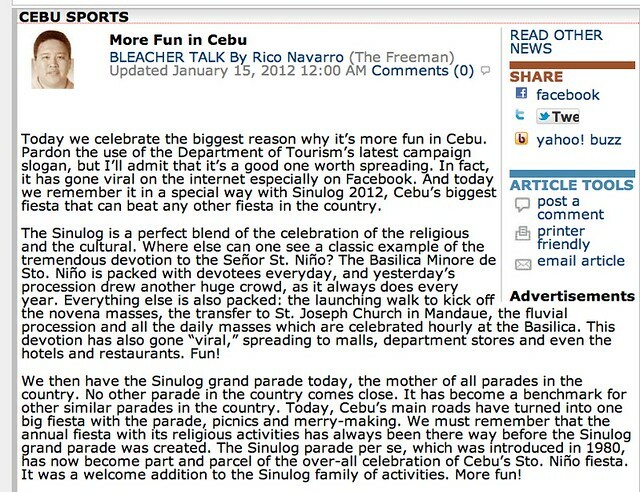 Enjoy the Sinulog. Pit Senyor! 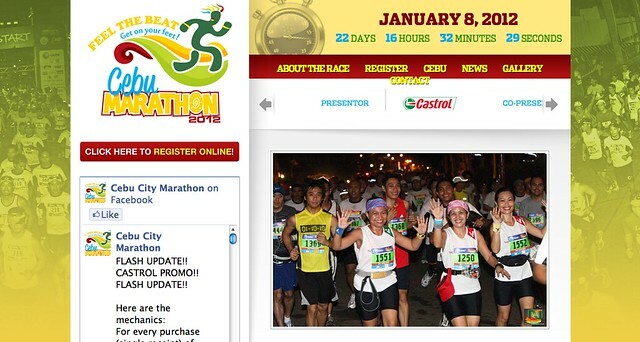 Visit the cebumarathon.com website now to check your registration details. The word has two meanings. In Tagalog, “puso” means “heart.” In Bisaya, it’s pronounced in a stronger manner: PU-SU! To us Cebuanos, we know the meaning of “puso.” It’s our favorite dish with lechon. We eat puso during parties. We bring bundles to the beach. Every important Filipino-style, get-your-hands-dirty event involves this hanging rice. Well-said. Why this talk of the puso? Because, after three years of the Cebu Marathon when the 42K finishers received their mango-designed medals — now the CCM medals have a different look. Puso. 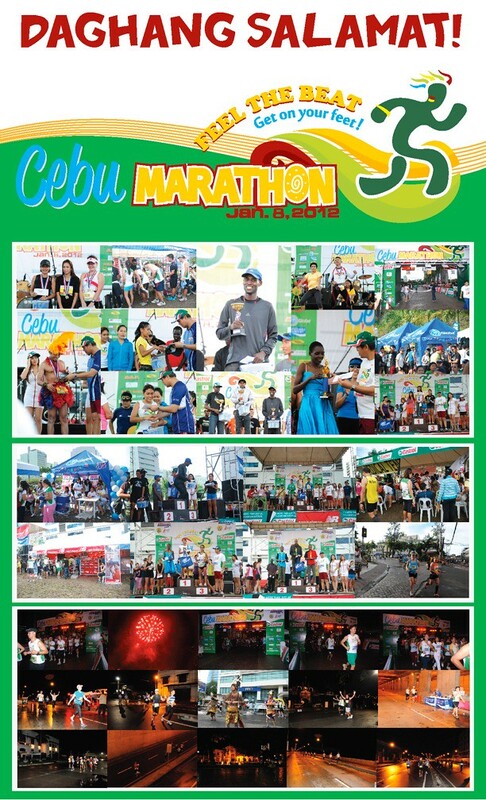 Yes, if you haven’t seen the photo yet, visit Facebook or the website (cebumarathon.com) and gaze at it. The puso represents Cebu. And it will be the prized possession of all 42.195-km. finishers of the January 13, 2013 race. Shifting to Tagalog, it also takes a lot of “puso” (heart) to run from the Cebu I.T. Park to the Capitol to the City Hall to the Tunnel to the SRP — all the way to Talisay — and back to Lahug. That takes sacrifice. That entails eating pain and suffering and offering tons of prayer when one passes the Basilica Menor del Santo Niño. That takes heart. And so, Bisaya or Tagalog, the word “puso” is the perfect representation of next Sunday’s reward. 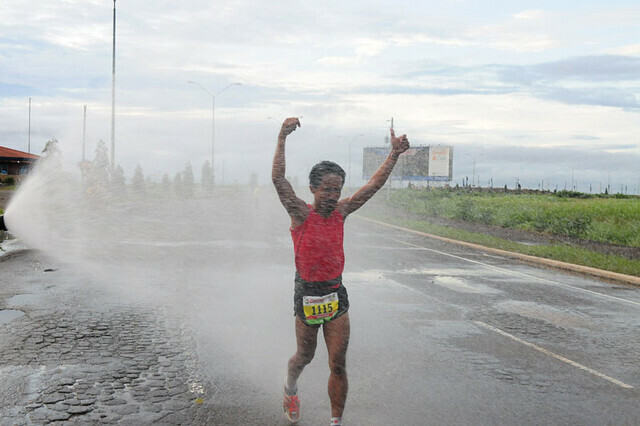 A “puso” for the “puso” (strong heart) of the marathoner! PRESS CON. We unveiled the medal last Thursday. When the CERC members and media personalities gathered in a long table, guess what was served in Mooon Cafe, our family-owned Mexican-inspired restaurant? Of course, the puso. The diners were puzzled. Does Mooon now offer puso? Our CERC group — Roy Trani, Kenneth Casquejo, Jesse Taborada, Rudy Tindugan, Dr. George Evangelista, Barry Marquez, Raffy Osumo, Annie Neric and Dodong Sulatre — aware of the surprise, didn’t comment. Together with pork barbeque, we just munched and ate. Finally, when the press-con started, I joked to the group, “It’s not true that Mooon now offers puso…” Then we unveiled the medal made by Suarez Arts. It’s a tradition that’s started and a tradition that will continue. That’s why, as each year progresses, the number of 42K participants increases or is maintained. This year, we’ll exceed over a thousand 42K runners. We want the 21K runners of this year to aim more, go farther, train twice as much — to make that moment when the medal is draped on one’s neck even sweeter. 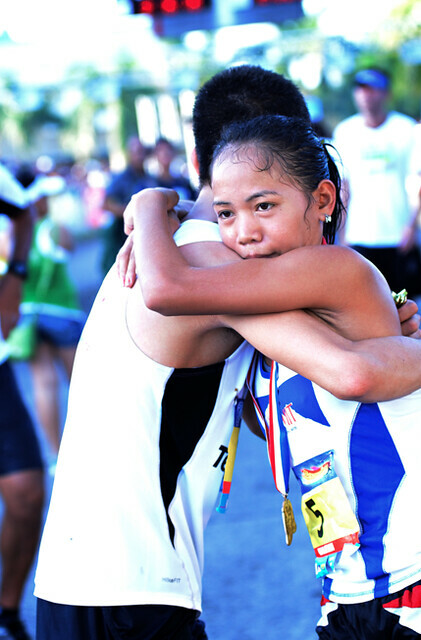 With every-Sunday races in Cebu today, collecting medals is no longer a rarity. Many runs offer medals. 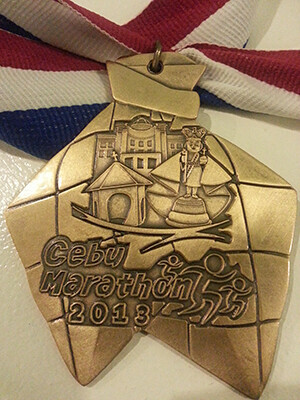 We’d like for the Cebu Marathon “puso” to be one of the most treasured of metals in your cabinet. This, therefore, is a challenge to all runners: Go for that full marathon at least once in your life. If not next Sunday, maybe in 2014. Finally, if you’re joining, visit the website to verify your registration details. Good luck and God speed! Last Tuesday, Cebu City Mayor Mike Rama – a runner both on the road and for public office – welcomed us to his Conference Room at the City Hall. In attendance were running enthusiasts Councilor Edgar Labella and Cebu Executive Runners Club (CERC) members Jesse Taborada, Dodong Sulatre, Meyrick Jacalan and Rudy Tindugan. Cebu City Sports Commission chairman Edward Hayco joined us. 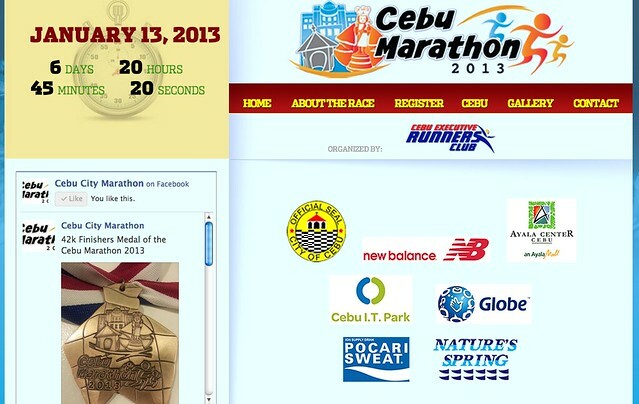 The occasion: To officially launch one of this island’s grandest of sporting events, the Cebu Marathon. The date? January 13, 2013. The venue: Start/Finish at the Cebu I.T. Park in Lahug. Distances? 5K, 21K and 42K. These three categories are perfect for any body and everybody. If you’ve longed to exercise and join a fun run, the 5,000-meter distance is ideal. You can jog, walk, stroll most of the way and sprint as you cross the finish line. The 21K or half-marathon? For those who’ve been running 5Ks and 10Ks, it’s time to take your running to the next level. The 21K distance is far — but not as leg-cramping and exhaustive as the 42K. The beauty of this category? 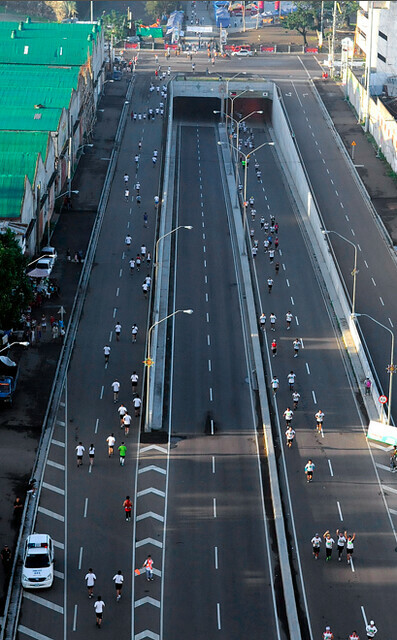 Just like the full marathon, it will take the runners along the most scenic of sights: from Cebu I.T. Park to the Provincial Capitol, down along Osmeña Boulevard, passing through Fuente Osmeña, to Colon Street, to the Sto. Niño Church, Magellan’s Cross, Plaza Independencia then down the SRP Tunnel. You may a U-turn somewhere at the SRP… and back to the Cebu I.T. Park. Everybody who’s done a 10K the past few months should register for the 21K. The 42.195-km. run called the marathon? For those who joined the 21K last year and have done several this 2012, it’s time to go all the way in 2013. You can do it! Along the way – and during this Sinulog season — you will be greeted by hordes of volunteers who will man the 13 water stations – all loaded with overflowing water and isotonic drinks plus the signature gimmick of CCM: bands, loud music, Sinulog dancers, cheerers — all motivating you to finish and claim that Finisher’s Medal. ROUTE. The only change with the 42K route is the Gen. Maxilom (Mango) Ave. area. In the three previous CCMs, the Mango Ave. portion was one of the last (and most difficult) climbs. 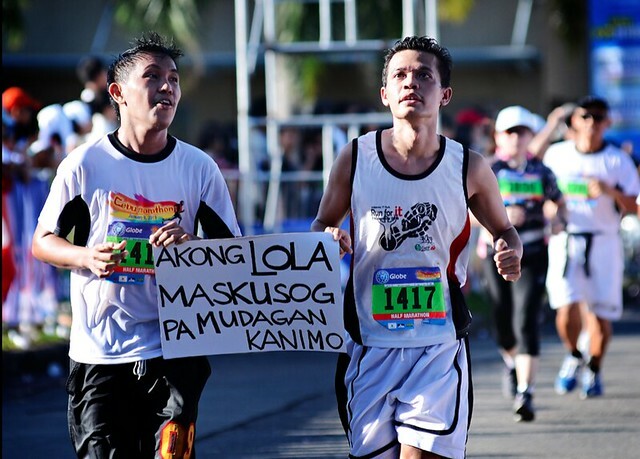 In the 2013 edition — as suggested by ultra-marathoner, Atty. Haide Acuña — we will do Mango Avenue first. This means that, upon exiting SRP, the 42K runners can now focus on running straight to the Cebu I.T. Park minus the Mango Ave. “Heartbreak Hill” obstacle. PRIZE MONEY. Thanks to the support of the Cebu City government, who has funded the cash prizes of all the winners since this event started years ago, the same will hold true this 01-13-13. Marathon (42K): P60,000 (champion); P30,000 (runner-up); P20,000 (3rd); P10,000 (4th); P5,000 (5th); and P2,500 each for the 6th to 10th placers. Half-marathon (21K): P20,000 (champion); P10,000 (runner-up); P5,000 (3rd); P2,500 (4th); P1,500 (5th); and P1,000 each for the 6th to 10th placers. 5K: P5,000 (champion); P2,500 (runner-up); P1,500 (3rd); P1,000 (4th); P750 (5th); and P500 each for the 6th to 10th placers. GOODIES. As I mentioned in this column a few weeks back, the participants will receive a limited-edition New Balance singlet. The value of this NB singlet is worth upwards of P700; if you’re joining the 5K (registration fee is P600), you’re actually receiving more than your fee. The 42K (fee: P1,400) and 21K (fee: P900) participants will all receive Finisher’s shirts (apart from the singlet) upon crossing the Finish Line. And, of course, exclusive to the 42K finishers, the prized CCM medal (new design). FREE MOVIE PASSES. Finally, here’s good (early Christmas) news for all runners who have not registered yet. Starting today, Nov. 22, until Nov. 30 — only for nine days — all registrants to the 21K and 42K categories will receive free Ayala Center Cinema movie passes. You need to register at the onsite registration booth at the Active Zone of Ayala Center Cebu. Remember: this is only from Nov. 22 to 30. Run to Ayala and register now! PUERTO PRINCESA–It’s our first time in Palawan, the home of the longest navigable underground river in the world. We arrived last Friday. While Typhoon Ofel left Cebu and it was sunny in Mactan, the skies darkened upon arrival in Puerto Princesa. It rained the entire Friday. Yesterday was the opposite: clear blue skies engulfed this island of blue seas. I’m accompanied by three girls — Jasmin, our daughter Jana, and top junior netter Sally Mae “Em-Em” Siso. We’re here for the national championships of the Palawan Pawnshop Junior Tennis — a Group 2 major event that has brought together 220 entries from all over the archipelago. Last Friday, we had dinner at La Terrasse with Roland So. No, he’s not the husband of Michelle — he’s the former No. 1 player who’s also here as a tennis parent. With his wife Tina, he brought along three of their six children: Camille, Mia and Mariel. UFC. I got plenty of feedback from last Thursday’s “UFC beats boxing” column and I’d like to share one, coming from a former Class-A tennis player and golfer. PACMAN. This is hard to believe. And it’s a sign. Manny Pacquiao, with just six weeks to go before his Dec. 8 fight against Juan Manuel Marquez, is absent. He’s not found in the news. There’s Donaire. There’s ALA. But there’s hardly any Pacman. This is surprising. Maybe the public is bored and weary of his 4th encounter vs. Marquez? Whatever the cause, the buzz surrounding Pacman is no longer the same. My advice for our modern-day hero? Pummel the Mexican, knock-him-out and then, before a worldwide audience, announce your retirement. Pacman’s skills, as we’ve witnessed in the past few fights, is waning. It’s time to end the career of the greatest Pinoy athlete ever. LATE ARRIVAL. It was a long and tiresome trip for Team Visayas. En route to the 4th National Milo Little Olympics, the delegation’s departure from Cebu got delayed by one day. They arrived in Manila on Oct. 19 (Friday) and had to be ferried straight to the Marikina Sports Park for the Opening Ceremony. They finally landed at the Robinsdale Hotel, all tired and travel-weary, past 9 P.M. – with games scheduled early the next day. That was the delay going to Manila. Coming home was even worse. After the Milo Olympics finished last Sunday, the Visayas Team was supposed to leave Manila last Monday. Instead — no thanks to Typhoon Ofel — they left four days later, sleeping in the boat as it got stuck in the pier. They finally arrived in Cebu only yesterday noon! Our group, the Cebu Executive Runners Club (CERC), held a victory and thanksgiving party two nights ago at my house. After the success and hard-work behind the Cebu City Marathon, which CERC organized, it was time to relax. We started with a Holy Mass officiated by Rev. Fr. Renel Cabag of the OAD. Then, it was the all-out eating of lechon, kare-kare, dinuguan… (yes, we marathoners, given the mileage on the road, gorge and eat buffet-style). Among the CERC members who attended the celebration were Roy Trani (CERC president), Jesse Taborada (past president), and Jacs and Perl Jacalan (the ASAP couple staying on until 1 A.M. when Perl celebrated her birthday at the strike of midnight). Also at the party were Jun Remo, Joel Juarez, 3:43-marathoner Steve Ferraren (our group’s best dancer), Steve de la Cerna, Barry Marquez, Arnold Palma, Rudy Tindugan, Dr. Albert Santos, Dr. Ian Barlaan, Ted Tecson, Jon Consunji, Kenneth and Dr. Tata Casquejo; my SunStar boss, Michelle So; XTERRA champ-to-be Dodong Sulatre; Roel Militar; 4:09 marathoner Nica Ong and Ironman women Annie Neric and Jane-Jane Ong. Two nights ago, while “Chariots of Fire” played in the background, we viewed pictures of Bro. Carlo joining the 102-K and 160-K ultramarathons. Yes, 102K and 160K! In fact, today, he is leaving for Manila (together with Atty. Haide Acuña) to join this Saturday’s Bataan Death March 160-km. run from Mariveles, Bataan to Tarlac. We wish Bro. Carlo and Haide good luck for the sure-to-be-agonizing 160K… and Bon Voyage to Bro. Carlo who’ll convert Laos into a running democracy. Just wanted to share with you the inspiring words that came out today in The Freeman. Written by Rico Navarro, a lifelong sportsman who joined the 21K of the Cebu City Marathon, here’s his column that appears today, Jan. 15. BTW, to all… PIT SENYOR!!!!! Thank you, Lord! When the rains deluged Cebu last Saturday night, we were worried. Rain is good. It usually is. But not during a major outdoor event like a marathon. But, thanks to His divine plan, the stormy weather stopped at 3 A.M. and the skies cleared (even from the scorching sun—perfect for the runners!) the entire day. Thanks to…. CERC. It’s called volunteerism. Members of the Cebu Executive Runners Club (CERC)—led by our president Roy Trani—have to be lauded for the many months of preparation. KENNETH CASQUEJO. Among the CERC members, none worked harder than Kenneth, the man behind the race-organizing company Run Check. Kenneth handled the bulk of the operations—from helping in the Registration to heading the Race Expo to delivering many of the supplies (water, bananas, Pocari Sweat). Good job, Ken! UC. The biggest contingent was from the University of Cebu. When I met Atty. Gus Go two months ago, he promised that his students will join. They did. Numbering 2,000, they crowded the streets. Special thanks to UC’s top officials Bernard Ricablanca and Emerson Subong. BOYING. Seven days ago, I received this SMS message: “Do you still need extra help? Although I am registered, won’t be able to run. Crashed my bike and sprained my wrist and ankle. Not being able to run will be frustrating but at least helping out and being part of it will ease the pain.” The sender? Top sportsman Boying Rodriguez, who helped last Sunday at the Plaza Independencia. SRP. By motorcycle, I was able to tour the CCM route. The best spot was the South Road Properties. The climate was cool. Both lanes were closed to vehicular traffic. The sunlight emerged from the waters off Bohol. Thousands of brave runners mustered the courage to fight their fatigue and run. TUNNEL. Among the 14 water stations that provided hydration, one of the best areas—manned by CERC’s Dodong Sulatre—was the tunnel. Two “higantes” entertained the runners. Free massage was offered. Cold water spray was splashed on the faces. Loud music boomed. Perfect. 12 NOON. Eight hours after we released the 42K runners at 4 A.M., the last runner, Francis Velasquez of Cagayan de Oro, arrived barefoot. 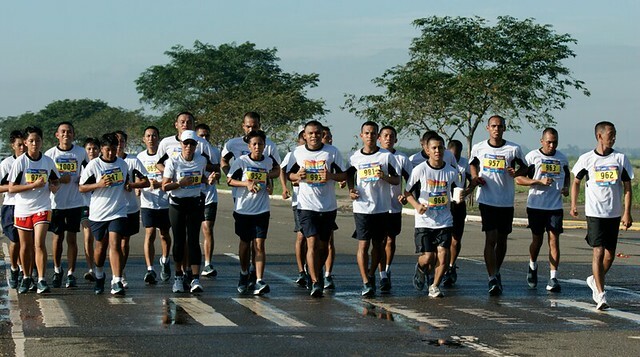 He ran without shoes (to raise funds for the victims of Sendong) the entire route. We gave his wife the finisher’s medal as she donned it on him at the Finish; they kissed and hugged as we applauded. JIGGY. Arriving just minutes before Francis was Jiggy Cerna who succumbed to leg cramps at Km. 22. Imagine limping the remainder of the way—that’s 20 more kms.—just to finish. That’s perseverance. Jiggy’s wife, Chay, who finished the 21K, patiently waited at the I.T. Park. What a gallant effort from the voice behind Y101. MAYOR. Proclaiming during the Press Conference that a healthy body is a prerequisite for a strong mind, Mayor Mike Rama joined the 5K. 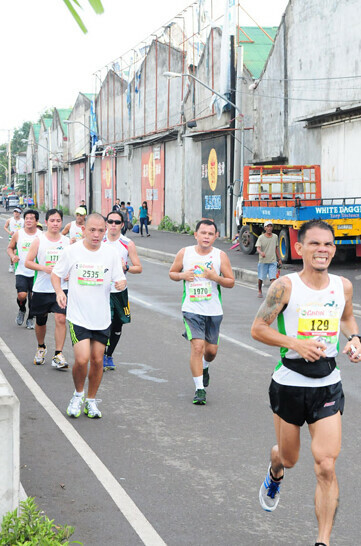 He wore jersey number “1.” Councilor Edgar Labella, a long-distance runner, also ran. CITOM. Nearly 100 traffic enforcers engulfed the city of Cebu last Sunday. With most of the roads closed to provide a safe passageway for the participants, CITOM played a most crucial role. CITOM Chairman Jack Jakosalem and executive director Raffy Yap: thanks! YAYOY AND ED. To Cebu City Councilor Raul Alcoseba, who spearheads the Committee on Sports, his backing for the prize money was invaluable. So was the support of CCSC chairman Edward Hayco. FIRE BRIGADE. Led by one of my closest buddies, Wilton Uykingtian, the Cebu Filipino Chinese Volunteer Fire Brigade helped cool the heating bodies of the runners. They were at Fuente Osmeña. They showered water at the SRP. MEDICAL. In an event covering 42 kms. in scope, medical response is most essential. The CERC is blessed to have many doctor/members. Thanks to our fellow CERC member Dr. Rosan Trani, we were able to enlist 10 more groups who spread themselves all over the route. Dr. Wyben Briones was one volunteer. He was stationed at KM. 36 in Gen. Maxilom Ave. Thanks to the All Terrain Medical Relief Organization (AMRO). 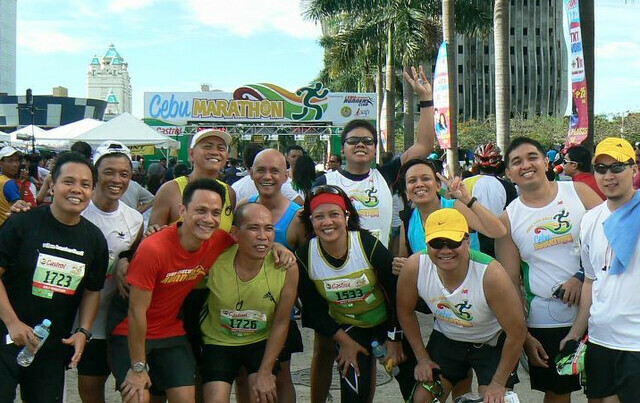 To all those who participated and finished the Cebu City Marathon yesterday, January 8… CONGRATS!!! All the months and weeks of hard work on the road have paid off… and you must be resting those legs and knees and recuperating. There’s no better feeling than seeing that finish line and crossing it. See you all next year! “The marathon is a charismatic event. It has everything. It has drama. It has competition. It has camaraderie. It has heroism. Every jogger can’t dream of being an Olympic champion, but he can dream of finishing a marathon.” – Fred Lebow, founder of the New York City Marathon. Those words are true. A rare number of Filipinos have ever joined the Olympic Games. No Pinoy—since we joined in 1924—has won the gold. But the marathon? The distance of 42.195 kms.? Running by foot—not riding the car, motorcycle or bike? Anybody—yes, that means any body, slim or heavyweight; teenager or a 78-year-old like Raul Cepeda—can achieve “the feat of feet” called the 42K. 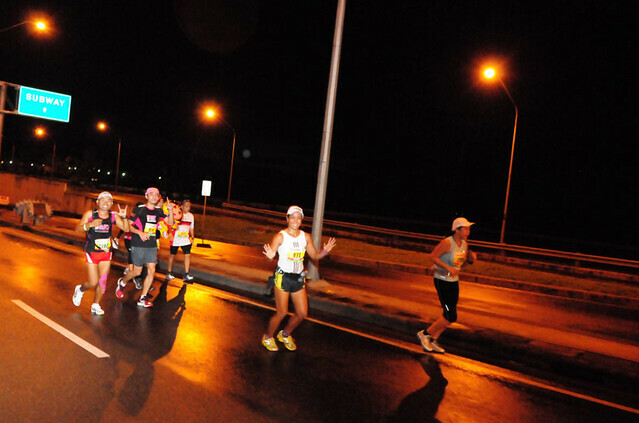 As you read this, thousands of runners have swarmed the streets of Cebu. They’re along Osmeña Blvd. They’ve converged at the Cebu I.T. Park. They’re sprinting in Escario, Gorordo or inside the SRP. Foreigners joining the Cebu Marathon? Sure. There are 18 nationalities represented: from Sweden, UK, Malaysia, Canada, Germany, Japan, Australia, USA, New Zealand, Ethiopia, Singapore, Hong Kong, Kenya, Malaysia, Denmark, Netherlands, Norway, and Thailand. The first participant when the online registration was opened several months back? He was from Germany. 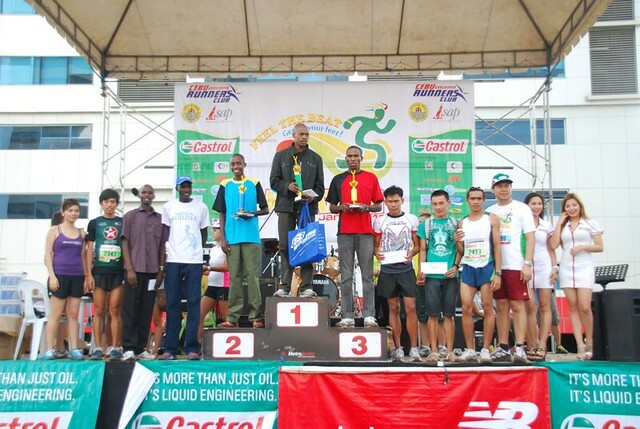 One Kenyan runner landed in Cebu two days ago. Armed with a PR of 2:13, he vowed to break the CCM 42K record. 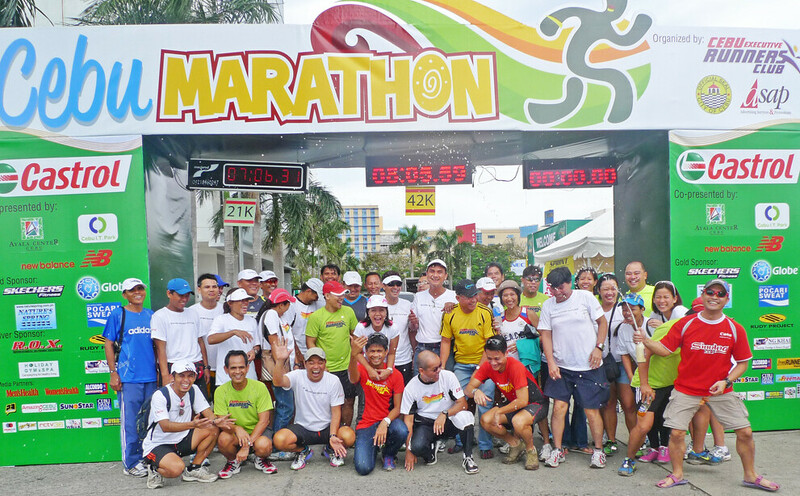 Like our very own Sinulog, the Cebu City Marathon has become international. Apart from those running the 42K, there will be thousands more joining the 21-km. run. Two nights ago during the Race Briefing at The Terraces of Ayala Center Cebu, I said that the 42K/21K runners are lucky. To all CCM participants, congratulations! 1) CHECK WEBSITE. 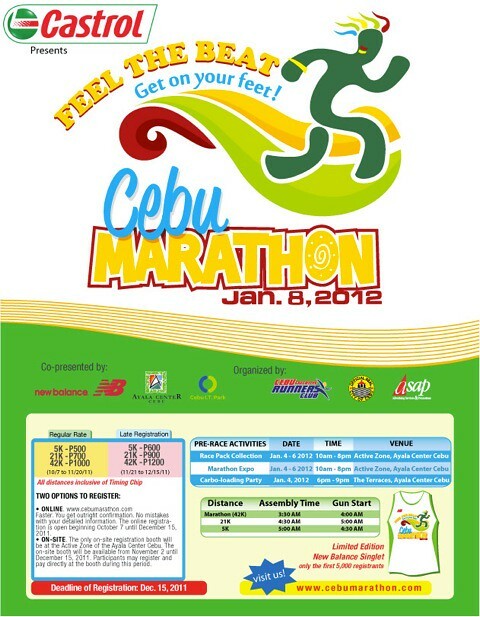 Log on to www.cebumarathon.com. We’ve posted all the participants’ names — 42K, 21K and 5K. 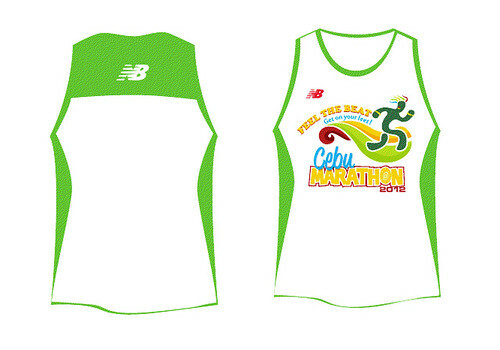 For any concerns, email us at info@cebumarathon.com. 2) VISIT RACE EXPO. Beginning tomorrow until Friday, race packs will be available for distribution. But here’s an important note: For tomorrow (Wednesday) only, the race packets of the 42K and 21K registrants will be distributed first. (All categories will be open Thursday/Friday.) CLAIMING: To receive your race pack, bring the email confirmation or claim stub that was sent/given to you. 3) JOIN CARBO-LOADING PARTY. If you’re a CCM participant, hear the final instructions and listen to top-notch runners during the Friday (Jan. 6) night Pre-Race Party. This will be at The Terraces of Ayala Center and will start 6 P.M. Load up on pasta and join the fun before the run. 4) RUN THE 5K. For those who failed to register on time last December, here’s good news. We are re-opening the registration during the Race Expo only for the 5K runners. 5K ROUTE. What’s exciting about the 5,000-meter Fun Run is the route: from Cebu I.T. Park down to Juan Luna Avenue… turn right towards the Cebu Business Park (passing along the Pag-Ibig Bldg.).. then run up to Escario St. (Parklane Hotel) before turning right to Gorordo then to JY Square … finishing at the Cebu I.T. Park. 5) TUNNEL & PLAZA. 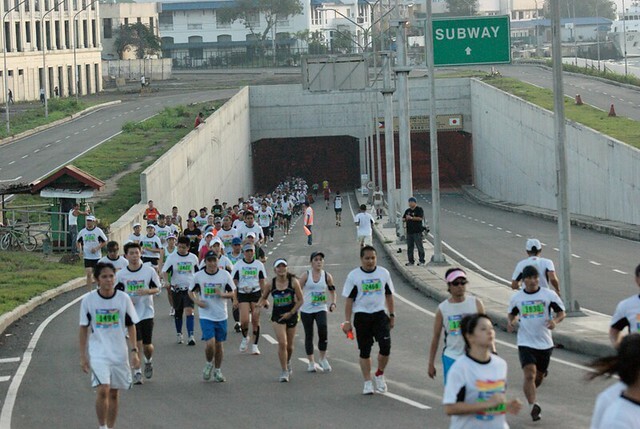 This January 8, the entire SRP Tunnel will be closed from 12 midnight until 9:30 A.M. for all the 21K and 42K runners. This is special. It is only during the Cebu Marathon that this 800-meter underground stretch of roadway is available for you to walk and run. Enjoy the tunnel! 6) PLAZA INDEPENDENCIA RUN. This park is beautiful. One of the highlights of Michael Rama’s mayorship, passing in-between the Magellan’s Cross and the City Hall then traversing inside the Plaza, we’re proud to call this running city… Cebu. 7) SRP IS CLOSED. The SRP—thanks to the joint efforts of the city governments of Cebu and Talisay—will be closed from vehicular traffic from 12 midnight until 9:30 A.M. this Sunday. Yes, I know this means inconvenience for the motorists—but it only happens once a year. And this is meant to ensure safety for the nearly 3,000 runners of the 42K and the 21K. SRP CUT-OFF TIME. For the runners, this means a cutoff time of 9:15 A.M. along the SRP and inside the Tunnel. If, by this time (which is 5 hours 15 minutes after the 4 A.M. start), you are still along the SRP/Tunnel, you will be asked to stop and ride the bus. 8) DRINKS GALORE. Nature’s Spring, our very own Cebu brand of water, will refresh all participants this weekend. For the sports drink, Pocari Sweat will be stationed along portions of the 21K and 42K route. 9) REST. With only five days left before the historic 01-08-12 date, it’s time to relax and recharge. The next few days is no time to cram your training. It’s better to be undertrained than over-trained. 10) RACE BIB. In case of emergency, we urge all runners to print the name of the person you wish to be contacted at the back of your race number. With several doctors as part of the Cebu Executive Runners Club (CERC), we are putting a lot of emphasis on our medical response. 11) WEAR COSTUME. Plenty of prizes will be given away to individuals and groups who don the best Sinulog-themed attire. Run and be seen. 12) FEEL THE BEAT, GET ON YOUR FEET! Thanks to the super couple named Meyrick “Jacs” and Perl Jacalan, the CCM has that perfectly-worded slogan. It’s days before the Sinulog and what better reason to run. You can dance, strut, glide, sprint or crawl. However you want to run the marathon, be sure to finish! 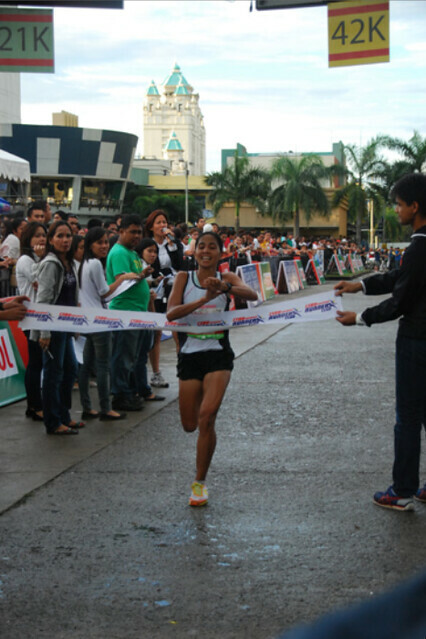 Just for three days, from December 22 to 24, the registration for the Cebu City Marathon has reopened. 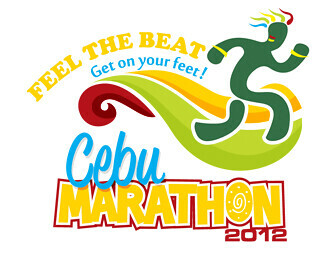 One may visit the Active Zone of Ayala Center Cebu or may register online at www.cebumarathon.com. While the Spooktacular (Run For Your Life!) Race this Friday night will have runners, literally, running scared, and while the annual Citigym Half Marathon is popular because of the 21K, a much bigger event looms just barely two months away: The 2012 Cebu City Marathon. The reason? The 42.195 km. distance. “I’ll run a 5K marathon this Sunday,” many often say. But that’s incorrect. Because a 5K Run, though enjoyable (like the Tribute Run for Melinda) is not a marathon. There is only one marathon distance and that’s 42,195 meters. That event is happening on Jan. 8, 2012. New Balance singlets await the participants. Live, Sinulog-type entertainment will excite the runners. Water stations will flood the streets every 1.5 kms. Cheerers will shout. CITOM personnel will close the South Road Properties. A Carbo-loading Party will provide a feast for all at the Ayala Center Cebu. Register now. If you’re got a credit card and can get online, enlist now. The rates are less expensive (compared to Nov. 20, when the “Late Registration Fees” begin). The distances are similar to the past two years: 5K, 21K, and 42K. The routes for the half-marathon and marathon will be the same as last Jan. 2011. Start and finish at the Cebu IT Park. Runners pass through Osmeña Blvd. en route to the SRP. The 5K route will be new—and to be announced at the press conference on Thursday. What makes this race different is the timing. It’s held seven mornings before one of Asia’s loudest of parties: the Sinulog. Thus, the air is littered with confetti, the streets are lined with buntings; drum-beating music will deafen our eardrums. Our theme: “Feel The Beat. Get On Your Feet!” Find out more at www.CebuMarathon.com. CITCI. Ken Salimbangon and Nestor Toledo comprise the one-two doubles tandem who organized the Cebu International Tennis Centre Inc.
Nicknamed CITCI and located in Laray, Consolacion, it is the only facility in this island that is home to 10 tennis courts. Yes, you read it right. Not two or four or six—but five clay-courts plus five hard-courts. This Friday to Sunday, Oct. 28 to 30, Ken and Nestor are helping organize the 18th leg of the Cebuana Lhuillier Age Group Championship at CITCI. Open to players aged 18 years old and younger (some as young as six years old! ), the event is Philta-sanctioned and many prizes await the winners. Registration fee is P300 and the deadline is this Thursday. Call now: 0922358845, 5144379 or 09229488739. PACMAN. The Nonito Donaire fight was boring? Who said so? Not when “Manuel” Pacquiao entered the arena three nights ago. Yes. That’s “Manuel,” not Manny. The Pacquiao lookalike, who’s reportedly an airport worker from Houston, Texas, entered the stadium and had everyone snapping their flash photos. Who was he? His name is Allan Rivera Manuel. HOOPS DOME. I spoke to Councilor Harry Radaza two nights ago. In preparation for the Nov. 5 PBA game (not the usual exhibition but a ‘bearing’ game) between Petron and Alaska, the City of Lapu-Lapu has installed more ceiling lights. This NBA-like arena, the only one in our province, has become even more NBA-like. Looking forward to next Saturday’s Blaze Boosters vs. Aces contest at the Hoops Dome.